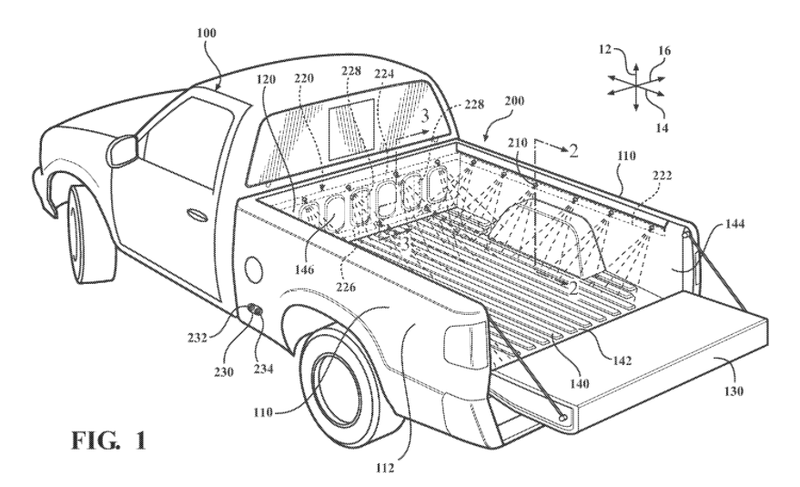 Toyota has filed for a patent for a system that, in theory, will help users wash out the beds of their pickup trucks. As pointed out by It’s Not That Simple—a website that regularly publishes cool automobile patents—Toyota’s invention is called “Integrated truck bed washing.” Here’s how it works. Everyone loves fancy truck gadgets, which is why we keep seeing weird tailgate inventions and silly ways to use truck boxes. Now there’s a new fun pseudo-gadget from Toyota Motor Engineering and Manufacturing North America Inc, and I haven’t decided if it’s pointless or practical. The idea essentially involves attaching a hose to a hookup on the bed, which feeds a bunch of pipes that ultimately send water to nozzles that spray the floor and walls of the bed. Toyota proposes a number of different design variants, some with piping built into the inner panels, some with retractable nozzles, some that actually have sensors to figure out if the bed is dirty and empty, some that actually use controllers to set a time for the wash and to oscillate the nozzle aim, and some that use a compressed air input in addition to a hose input to add water pressure to the system. It can be time consuming for a user of the vehicle to manually sweep out, or otherwise clean, the bed of a pickup truck. I myself am not sure how much of an advantage such a setup would have over just a power washer at the local car wash, or a garden hose with a nozzle on it, but then again, I don’t find myself cleaning out truck beds often, so what do I know? In any case, I think this bedwetter is a fun idea.